With the line blasters that fall above in the right part of the screen release all the pets from their pet boxes. Then the strategy is simple. 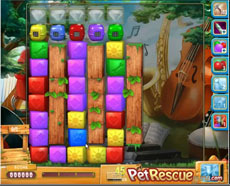 Clear large clusters of blocks in the right part of the screen to activate the paint brush booster and rescue the demanded number of pets to pass the level. Watch the video below to understand our strategy.